At the invitation of Crisis Mappers, I delivered a presentation on ICT4Peace to an audience from around the world at an ungodly hour in Sri Lanka yesterday. 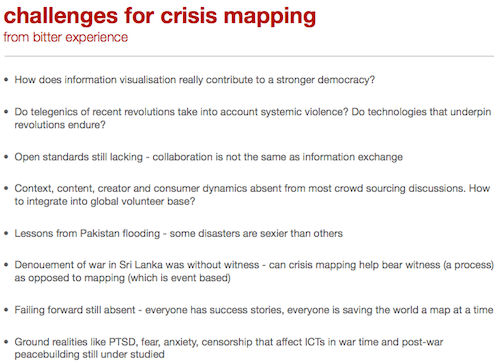 Though Jen Ziemke’s notice on the Crisis Mappers website noted that I would be talking about the latest in the field, when in fact I spoke about the failures and challenges of my work in Sri Lanka for over ten years in using ICTs to bear witness to violence, in citizen journalism, in electoral democracy and in response to disasters. Crisis Mappers promises to make available a recording of the session in the coming week, which I will link to once online. In the meanwhile, here the presentation around which my submission was based on. The penultimate slide, #20, engaged the audience the most and was developed from the tweets I authored live on the ICT4Peace Foundation’s account during the Crisis Mappers conference in Boston, in October last year. Download a PDF of these tweets here. These are issues that I have spoken and written on widely, and I think require more robust attention – or more accurately, as much attention as the more optimistic accounts of crowd sourcing and crisis mapping get in the global media.